John Marshall High School, Glen Dale, WV, opened September 3, 1968, a consolidation of Moundsville, Benwood-Union and Sherrard High Schools. It was built in a town that never had a high school. The school colors—gold and brown—were a parting from any previous local schools’ colors of orange, blue, red, black, or white. 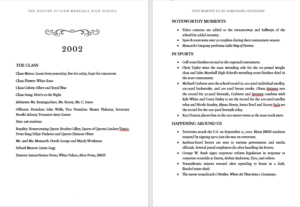 The schedule was far from traditional, based on the book And No Bells Rang by Dr. Delman Miller and Lloyd Trump. Marshall County wanted to do something different, and the results were special. 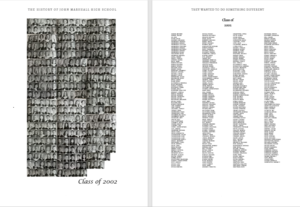 This book chronicles the first 50 years of John Marshall High School with each class represented by a photo collage, class roll, and highlights. 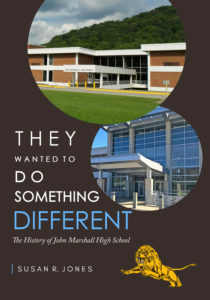 Also included is an account of how John Marshall High School came to be, shared by those who were on the ground level of making it happen. Release date is scheduled for November 1. All pre-orders will receive free shipping. Pre-orders for the hardback print version is available in our online store ($40). 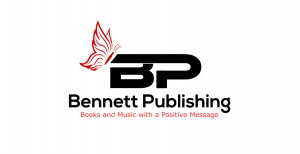 The Kindle format ($10) coming October 15.